The 53rd Annual Sherman Service League Charity Ball was held in March, at Tanglewood Resort. 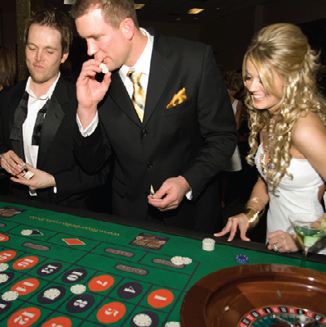 This year’s theme was Casino Royale, and guests were treated to Vegasstyle décor, a lavish buffet, professional gaming tables and music by Groove Academy. The proceeds went to benefit the Service League’s 17 sponsored organizations, including the Children’s Advocacy Center, the Crisis Center, Early Childhood Intervention and Home Hospice. “This year was a record-breaking year for us on many levels. We sold all the tickets for the ball and raised over $60, 000,” said Courtney Kernek, the Service League Ball Chair. Sponsors who contributed to the success of the event were American Bank of Texas, the Herald Democrat, Team Bonner, A. G. Edwards and Merrill Lynch. Silent and live auctions were held during the event that brought a rush of pleasant rivalry as guests bid for their treasures.